Home / Blog / Two pieces of exciting news! The Saylor Foundation has not one, but two very exciting pieces of news today! First, we are thrilled to announce a formal partnership with StraighterLine. Beginning in the Fall of 2012, students taking advantage of this partnership will have the opportunity to earn college credit for a very low cost. More details are available in the press release – located here – and in this Chronicle of Higher Education blog post. And, for our second announcement, this partnership, and the rising costs of a college education, is prompting the formation of a working group between the Saylor Foundation, StraighterLine, and two universities located in northern Virginia – George Mason University and Northern Virginia Community College. We’re still working out the details of the working group, however the objective is create clear articulation plans among the participating groups so students who have the discipline for independent or accelerated study would have frictionless transfer, leading to a low cost college degree. Here’s a link to the official announcement. We’re enthusiastic about the opportunities that these developments will create for Saylor.org students. Please keep a close eye on our website and blog in the coming months for updates on both announcements. 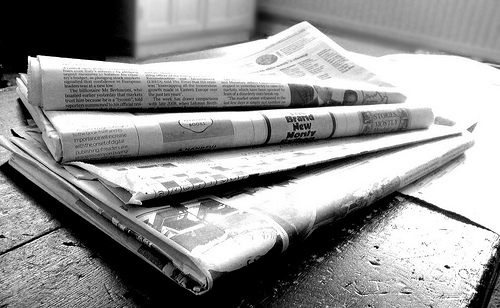 The image “Newspapers B&W” came from Flickr user NS Newsflash and is licensed under a Creative Commons CC BY license.